Figure 841. Dial to Claggett clock, 1730-40. Figure 843. Dial to following clock. A Claggett clock in a lacquer case, the property of Mr. William Ames, of Providence, is shown in Figure 842. The dial is the most beautiful Claggett one known, and is shown in detail in Figure 843. Above the domed top are engraved the maker's name and the phases of the moon. The semicircular plates on either side are beautifully engraved. The clock has a musical attachment striking on ten bells, and the small dial at the right-hand upper corner regulates the tunes, which are "Britons, Strike Home," and "Happy Swains." The dial at the upper left-hand corner would appear to regulate the time at which the tunes should be played. The small dials at the lower corners are for the calendar attachment, that at the left indicating the days of the month and that at the right indicating the month. Below each month are numerals indicating the number of days that are in that month. The spandrels are composed of scrolls and are, of course, broken at the centre by the small dials. The second-dial is ornamented by a six-pointed star. 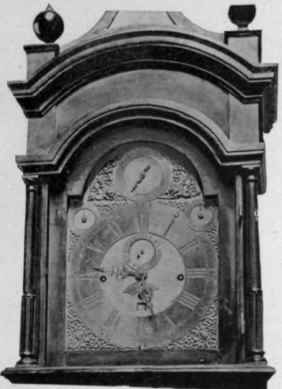 An interesting Claggett clock, which is the earliest hanging or mural clock known in this country, is shown in Figure 844. It is owned by the Newport Historical Society, and hangs in the museum, which was the old Seventh Day Baptist Church, in the place for which it was made. The case about the dial is octagonal and the entire case and dial are lacquered. On the edges of the three lower sections of the octagon is painted, "William Clagget, Newport." This form of clock became popular in England in the late years of the eighteenth century and is found here in the first quarter of the nineteenth century in the form known as banjo clocks. This clock dates about 1740. Figure 844. Tall Clock with japanned case made by Claggett, 1730-40. Figure 845 shows a clock having a dial very similar to that shown in Figure 841. The case is made of walnut with bands of the early form of inlay. On the square name-plate is engraved, "For John Proud, Newport." 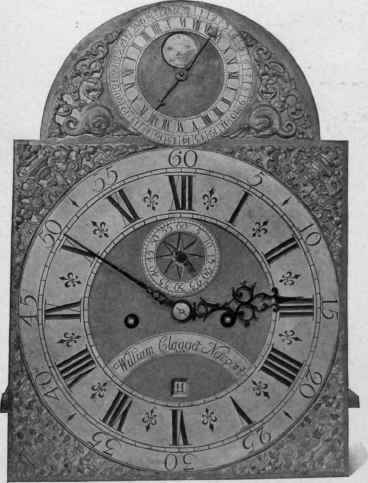 The dial, hands, and spandrels are so similar to those made by Claggett that it seems highly probable that this is a Claggett clock and that Proud substituted his own plate, the word "For" indicating that he did not claim to be the maker. This clock is the property of Mr. Thomas G. Hazard, of Narragansett Pier. Figure 845. Tall Clock, about 1740. Figure 844. Wall or Mural Clock, about 1740. From about 1730 down toward the close of the century there was very little change in the general style of the clocks. They were all either the tall "grandfather" or the portable clock. Figure 846 shows a musical clock, in a Chippendale case, belonging to Mr. Charles Morson, its chief difference from those heretofore described being that the lower part of the case is kettle shape. Figure 847. Dial of clock shown in following figure. Figure 846. Musical Clock, Chippendale case, 1760-70. Figure 847 shows a detail of the face of this clock. It will be seen that the late spandrels are in the two lower corners. 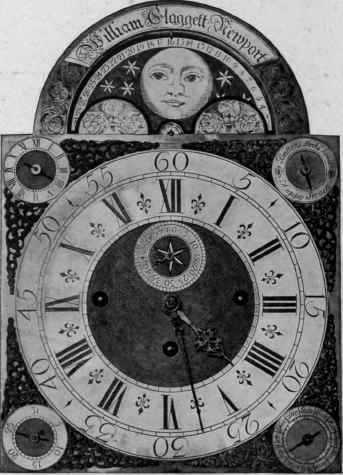 This clock was made by Joseph Rose, of London, who, with his son, had a shop at 19 Foster Lane from 1765 to 1768. The clock has both a chime and a musical attachment. The upper dial sets the musical part to play either a polonaise or a march. The dial to the left, as one faces it, regulates the strike, and that on the right the chime. Such clocks as these were not only imported into the colonies, but there were several clockmakers here who advertised to make them. In the Boston Gazette for February 22, 1773, the following advertisement appears: "Benjamin Willard" (first of the famous American clockmakers of that name) "at his shop in Rox-bury Street pursues different branches of clock and watch work, has for sale musical clocks playing different tunes, a new tune every day of the week and on Sunday a psalm tune. These tunes perform every hour without any obstruction to the motion or going of the clock and new invention for pricking barrels to perform the music and his clocks are made much cheaper than any ever yet known. All the branches of this business likewise carried on at his shop in Grafton." Figure 848 shows another tall clock in a lacquer case, the property of Dr. Edward L. Oatman, of Brooklyn. The spandrels are in the form of scrolls, and on the dial in the dome is engraved "White Matlack New York," who worked in New York from 1769 to 1775. Figure 848. Tall Clock, japanned case, about 1770.